Like most Caribbean family beach getaways, Aruba offers visitors opportunities to rest in the sun on a tranquil beach, as beautiful, gentle blue waves lap at the sand. Conversely, unlike most Caribbean beach getaways, Aruba is located outside of the hurricane belt, a mere 19 miles north of the Venezuelan coast. Its climate, averaging a steady 81º F year round, is dry and arid and its cactus-covered landscape is rugged. A unique combination of the Dutch and Caribbean cultures make Aruba, an autonomous member of the Kingdom of the Netherlands, an interesting island to explore with the family. Whether you are looking to discover the natural beauty of the island and its native creatures on land an sea, or you want to slip and slide at excellent water parks, Aruba has something for everyone. Take a break from your beach resort hotel and explore the island and all of its culture, history and fun! 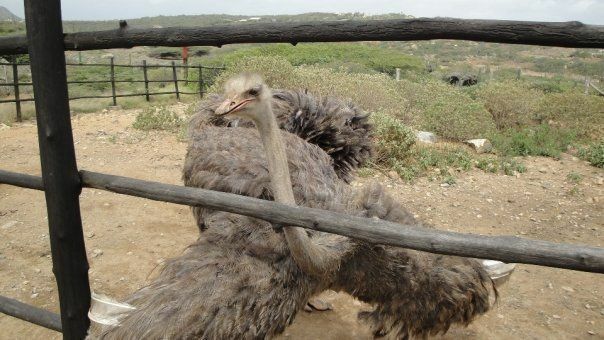 If your kids are into big animals, head to the Ostrich Farm where the family can get up close and personal to the two biggest birds on earth: the ostrich and emu. The island’s rugged landscape provides a great home for the 80-plus birds that live, eat, run and breed at the farm. Guided tours are given every half hour from 9am-4pm ($12 per adult, $6 per child). Guests will learn that ostriches can run up at up to 43 miles per hour, their powerful legs allow them to kick like kangaroos and they can even see up to 2.2 miles away. At the conclusion of the tour, guests visit the hatchery where they can spend some time with incubating eggs. Head back up to the farm’s restaurant; for the adventurous eater, have an ostrich burger. A staple in Aruba, the meat is red, similar to beef, but the healthiest meat one can eat, as it is low in fat and cholesterol and high in protein. For more than 500 years donkeys were a major facet of the Aruban economy. The animal served as the main form of transportation of goods and people throughout the island until the advent of cars in the early 20th Century. At that time, this decreased need, along with a rare disease, diminished the donkey population which declined from 1,400 to only 20 in 1970. Got Donkey (Shrek) or Eeyore (Winnie the Pooh) fans? The Donkey Sanctuary, a nonprofit organization dedicated to preserving these animals, opened in 1997 as the home to 62 donkeys. It has been educating islanders and visitors about the importance of donkeys ever since. Admission is free, although donations are greatly appreciated, and guests are free to feed and pet the creatures. Volunteers supervise visitors and they are bursting with knowledge about the sanctuary’s donkey family, which currently has 90 members. 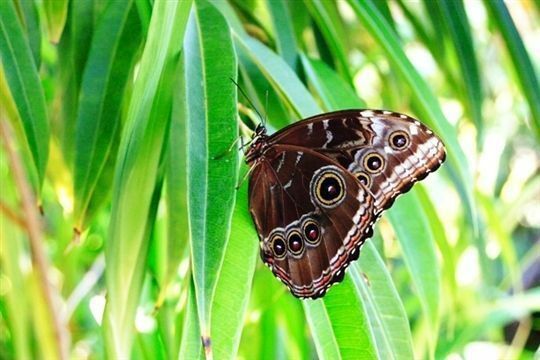 Located on the grounds of the Bubali Bird Sanctuary, Aruba’s Butterfly Farm gives guests an up close encounter with beautiful butterflies in a tropical and lush environment. Enclosed by mesh structures and surrounded by exotic flowers and pools with Japanese fish, the farm features hundreds of butterflies. Open seven days a week from 9am-4:30pm, the farm gives 25-minute expert-guided tours that show visitors the evolutionary life cycle of these blossoming creatures. Those who arrive early may even have the opportunity to see the birth of a butterfly emerging from its cocoon. Dress the kids in bright colors and even spritz a little perfume on them, as butterflies are attracted to nice smells and vibrant shades and they might even land on the shoulders of the little ones. Visitors can also take their own pictures, so bring a camera, be still and be patient, to get some great and colorful shots. Admission is $13 for adults, $6 for children ages 4-16 years and youngsters 3 and under are free. If your little ones are curious about what is under the sea, but too timid to explore it on their own, consider booking a ride on the Atlantis sub. Submerging 130 feet deep into the waters of the Caribbean Sea, the tour takes visitors to two shipwrecks, including the famous Antilla wreck of World War II, and spectacular coral reefs, such as the Arashi, where you can see colorful fish up close and personal. US Coast Guard approved, the sub is the largest passenger submarine fleet in the world and features plenty of big portholes for your viewing pleasure. First visited by human beings more than 4,500 years ago, the island of Aruba is overflowing with history and artifacts that convey its beginnings. This museum, the only one of its kind in the entire Caribbean, allows visitors to trace Aruban history with interesting relics, such as pottery, ceramic tools, skeletons, ancient art rock, and many other excavated artifacts. The entire facility recently underwent a $12 million renovation and expansion and has started to offer public programs, lectures and workshops in hopes that Aruba’s cultural legacy will always be remembered. Open from 8am-4pm Monday through Friday, the free museum is considering expanding its hours pending the success of its new public programs. If your family is looking to explore the Aruban countryside and other beautiful natural features, consider horseback riding with Rancho Notorious. Home to Aruba’s “happy horses,” the ranch is located next to the high rise hotels and offers free round trip transportation to and from its location. Specializing in beginners, children under 6-years-old are permitted to ride with a parent and all children 6-14 can ride alone, as long as they wear the required helmet. Tours are multi-lingual, small, personal and show visitors the best of the Aruba countryside. Kid-friendly options for all skills levels include an hour-long countryside and hidden lagoon tour and a two-hour beach and Malmok Reef water excursion. Other more rigorous and galloping rides are available, but only recommended for families with older teenagers. Prices for regular tours start at $45 per person, while the private tour option (good for novice riders) starts $120 per person. If horseback riding doesn’t sound appealing, the ranch also offers similar tours on ATVs and mountain bikes. There are plenty of other ranchos scattered through Aruba, but Rancho Notorious is the most child-friendly. A combination of tennis and beach volleyball, beach tennis is a great activity for a family to blow off some steam. At the Moomba Beach Bar, located on Palm Beach on the northwest side of the island, there are two permanent beach tennis courts. Racquets and a ball can be rented at the bar’s souvenir shop for $5. Score is kept just like regular tennis, the only difference: it is played in sand and since the sand is soft, the ball obviously can’t bounce. If you and the family take a fancy to the sport, the courts hold weekly competitions that you can enter or even watch. Note that around sunset is the best time to play, as the Aruba heat during the day might make it difficult to enjoy the game. After spending a day in Aruba’s hot sun, your skin will certainly need some refreshment and the aloe plant is the perfect remedy. Luckily Aruba, sometimes called the “Island of Aloe,” is one of the biggest exporters of the plant in the world. Families can visit the 160-year-old factory of Aruba Aloe, the oldest company on the island, and learn how to harvest aloe gel as they tour the fields. Also in the on-site museum, guests can see the production process and get a tour that will explain how to use aloe to take the sting right out of their sunburn. Tours are offered Monday through Friday from 8:30am until 4pm and Saturdays from 9am until 1pm. Adults are $8 and children are $4. 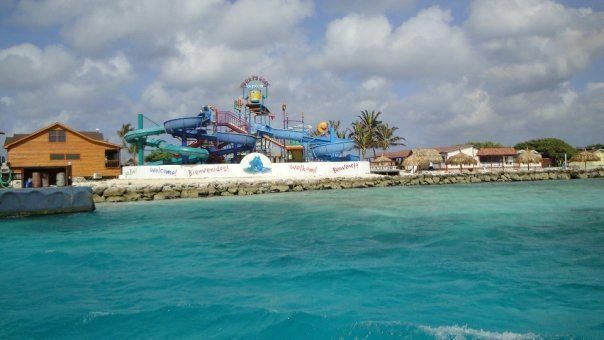 Although Aruba is already a tranquil island destination, for visitors looking for a really secluded area, head to De Palm Island, a private getaway and fun-for-kids paradise located off Aruba’s coast. Visitors can opt for half or full-day options on the island; the all-inclusive (including unlimited food and drink) rate for a full day is $115 per adult and $85 per child. Transportation to and from the island (via bus, Jeep tour or boat) is included in this price. On De Palm guests can enjoy the fun and interactive Blue Parrot Fish Waterpack which features wet and wild slides and big buckets of pouring water. Kids will love exploring the surrounding waters and reefs; snorkeling is included in the all-inclusive rate. Parents looking to splurge should consider the Snuba or Sea Trek experiences, both of which allow guests to experience the ocean world below with plenty of oxygen flowing and without the heavy SCUBA equipment. Or grab a longue chair and enjoy the soft sand and light waves on De Palm. Plus, there is a spa on the premise too if mom and dad are looking to treat themselves to a massage. The owner and operator of De Palm Island and some of the best Jeep Safari tours on Aruba is De Palm Tours, the biggest and oldest tour operator on the island. The company provides visitors with dozens of different ways to explore Aruba. Check their website for tons of fun ideas. 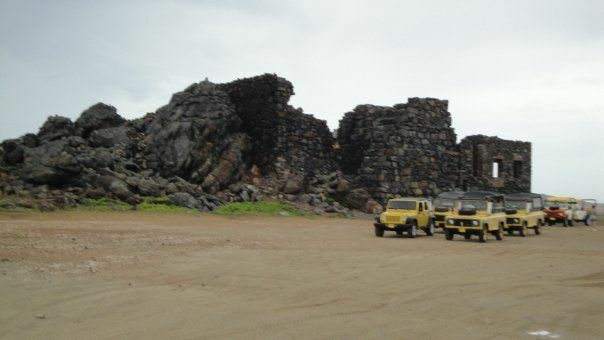 For families looking to discover the rugged landscape of the Aruba’s coast, book a 4×4 jeep tour with De Palm. The ride in either a Wrangler or Land Rover is a bit bumpy (although the friendly drivers provide ginger ale and granola bars for riders who get motion sickness), but it is one of the only ways to see the Natural Bridge and Pool, as well as Arikok National Park. Additional sites include: the Bushiribana Gold Mill ruins, the Alto Vista Chapel and the California Lighthouse. 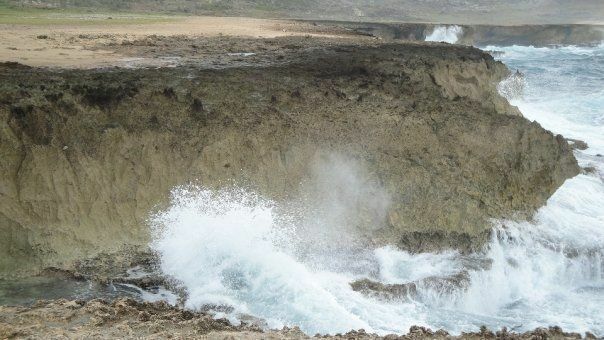 As you explore the cunucu (or the countryside in Aruba’s native tongue, Papiamento), enjoy the jagged and sometimes even harsh parts of Aruba’s land with an informative guide and driver. This recently-opened family amusement facility is located at Palm Beach Plaza. 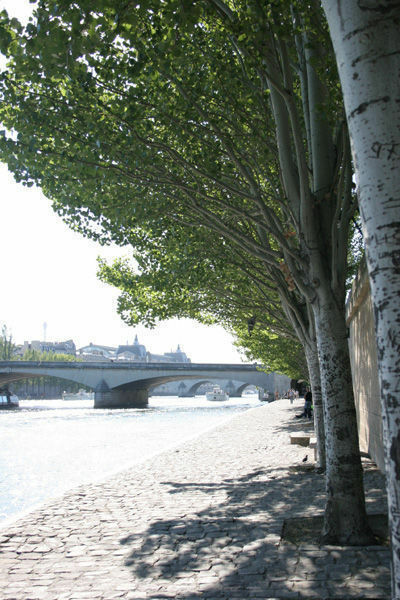 With 2,000-square meters of recreation, there is truly something for everyone. Activities include video games, rock-climbing wall, laser tag, and 4-D encounters. Fun City also offers Flow Rider, the first of its kind in the Caribbean. This sheet wave imitates an ocean swell for a thrilling flowriding experience without the ocean. 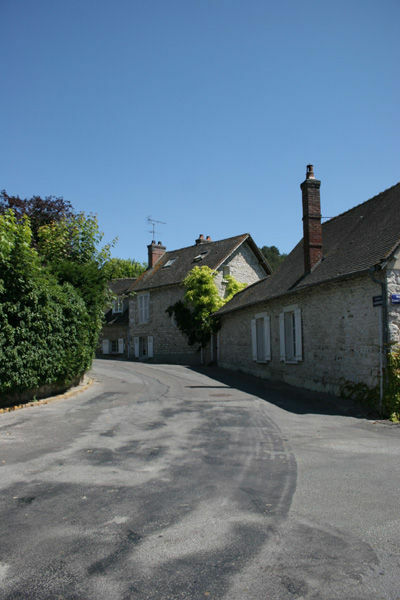 Also available for the youngsters, is Day-Care with a playground and a baby gym. 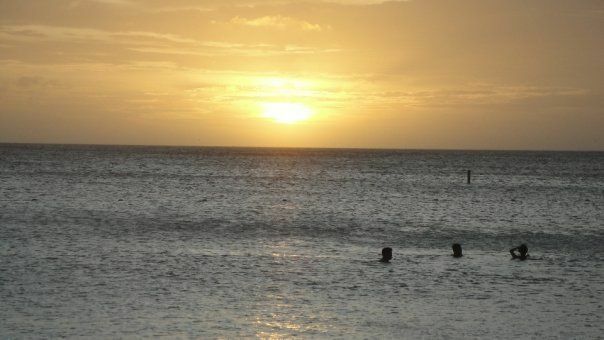 For more information and ideas on what to do in Aruba during your stay on the island, visit www.aruba.com.